Alive Ministry is a vibrant Spirit-filled church where healing and deliverance take place and the move of God is evident. It is governed by the Word of God under the leadership of Apostle Annette Deer and Senior Pastor Michael Deer. Here you will find true worship that honors our Lord and Savior Jesus Christ. You will find saints with changed lives and testimonies about the goodness of God; Families that are nurtured and uplifted; Young people who are alive, active, and growing in the grace of God. This ministry makes a profound difference in our local community with various outreach programs and also supports international missions. We are moving Upward, Outward and Forward in Jesus Name. Alive Ministry began 1997 in a two car garage without heat or electricity. There were 6 to 8 adult members and ten children. From the very beginning, Alive Ministry's movements have been by faith and not by sight. As the weather got cold, the church moved into then sister Annette Deer's living room. Little did she know that God would have her to be the leader of this awesome work. The first Sunday Worship service was held on October 5, 1997. God nurtured the body and communed with them there. The church then had a series of moves that tested their faith. The church moved into a storefront at 9115 Rockaway Beach Boulevard. Quickly out-growing that space, the church moved again to a bigger garage space at 1420 Pinson Street, Far Rockaway in July of 1998. The congregation had a mind to work. All resources were exhausted in cleaning, painting, and install carpet and equipping the space to accommodate the growing membership. The church remained focused on doing the work of the Lord and not be distracted by the surroundings. 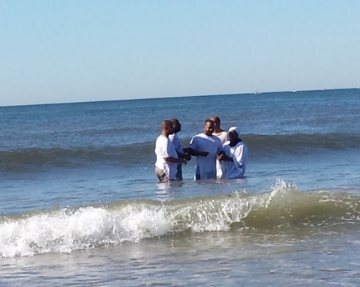 Through outreach meetings and personal evangelism, there was a profound impact made in the Rockaway community. In less than two years, the landlord sold the building and the new owner gave the church two weeks to relocate. Despite that fact, the church remained focused on the scripture found in Romans 8:28 (For we know that all things work together for good to them that love God, to them who are called according to His purpose). In this, the Lord was ready to move the church out of the shadows. The church ended up on the very busy street in a still too small location at 1417 Beach Channel Drive in Far Rockaway. Souls would walk in to hear the good news. When special services were held, the sidewalk would serve as the overflow room. To God be the glory. In spite of all the circumstances, the Saints were still able to serve God. In the passage of time, Alive Ministry was again looking for another location to rent. With a heart to find stability for the church, Pastor Annette Deer shocked most in the congregation by agreeing to buy a building that cost over $400k dollars and required a $150k down payment, even though she had only 10k in pledges. She believed the Lord, and the Lord brought all things together and miraculously made it possible. In 2004, Apostle Deer again led the congregation by faith to move into the new building before the loan was secured and the contract was signed. It is now the headquarters of Alive Ministry, 1050 Beach 21st Street, Far Rockaway, New York. We serve a mighty omnipotent God. In November 2018 Alive Ministry celebrated their 21th Church Anniversary. To God Be The Glory!